FORE!! ....Get ready to tee off with these custom Bushwood Country Club golf balls. Orange golf balls from a golf course that does not even exist!! Yes that's right, the Bushwood Country Club logo has been custom designed on these Wilson golf balls. An intelligent distance ball, the Wilson ball delivers a firm response off the tee for maximum distance, and a soft response around the green for exceptional feel. FORE!! 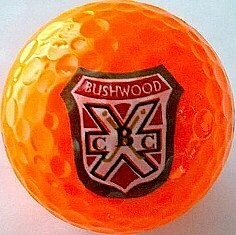 ....Get ready to tee off with these custom Bushwood Country Club orange golf balls.